This is nothing to do with anything so far but it is brilliant so I thought I would tell you. Last time we went to the library we found a book, it is fairly surreal and everyone should read it. I love reading and silly stories and kids stories and reading silly kids stories, that’s probably a good thing as I don’t get much time for reading grown up stories at the moment because it is hardly ever quiet in our house. By the way, don’t read this post if you don’t want me to tell you the end of the story because I probably will. 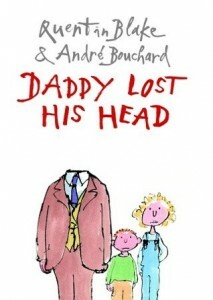 The book is ‘Daddy Lost His Head’ by Quentin Blake and André Bouchard. It is about a daddy who comes home from work one day without his head, he keeps bumping into things because he can’t see. However, he can hear and follow instructions so his family sit him down quietly while they look for his head and after failing to find it they make him a new head out of newspapers which they paint and add a potato for his nose. As he didn’t have a brain to think for himself, Mum told him what to do which got lots of cleaning done and also she was pleased that he no longer snored. 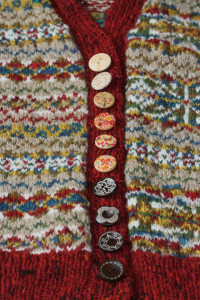 He is still able to do some things ‘thanks to the Super Brilliant Force of Habit’- the children take him to the toy shop, one steers him and one hides inside his jacket to do the voice and Dad can still manage to type in his PIN without thinking about it. One day he came back from work with his real head, he had left it at the office because ‘he needed all of his brain to work on a project that was Ultrasupertopimportant’. Dad didn’t remember about any of it and everyone else was very pleased because his real head had the recipe for chocolate cake and all the bed time stories in it. The drawings are great; Dad’s paper head does look surprisingly like his real one. Quentin Blake’s drawings always make me smile (I can remember reading Mr Magnolia when I was littler than I am now and being able to picture the drawings vividly even when I hadn’t seen a copy for years). The words are fantastic and silly, I’m not sure small people understand most of the jokes but maybe that’s half the fun. This entry was posted in Books and tagged You should definitely read this book. Bookmark the permalink.